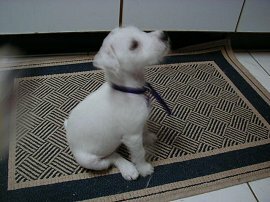 Deaf dog: Mia is a 13 week-old Jack Russell Terrier. Her mom writes: "Mia is Spanish for Mine. She is Ludwig's half cousin and I'm happy to have her in my family. She is a very special little girl. Because of Mia, we are all learning ASL! I believe only good things can happen when you adopt a deaf dog!" Human companions: Nancy E. Triana and two teenagers, a 16 year old girl and a 14 year old boy. Other pets: Tutti-Frutti, a 4 year old Chihuahua; and two cats, Cleo and Miso. Deaf dog: Kari is a two year old Jack Russell Terrier. Her mom writes: "She is the sweetest and smartest dog. She has some fears that are being overcome due to the previous owner that had no knowledge of how to call her or give her commands. She is learning to be more trusting now knowing when she is asleep, I will call her gently like a deaf person knows how." Human companions: Alyce Hand; her children and grandchildren; the entire family is deaf. 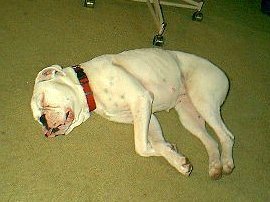 Deaf dog: Bonnie, a Boxer/English Bulldog mix, is approximately 2 years old. 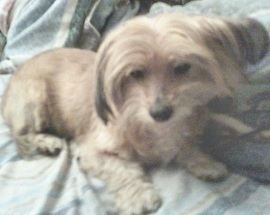 Her mom writes: "Bonnie is a sweet dog that my mom found roaming the countryside of Tenn. I know that she was well taken care of at some time. This is the first experience I have had with a deaf dog. I would DO THIS AGAIN IN A HEARTBEAT! While we have a long way to go and would take any suggestions from all on things that have worked well for them." Human companions: Colleen Bailey and her husband Brian. Other pets: Three birds: Joey, Alex and Sasha. 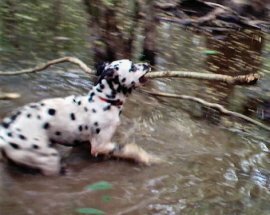 Deaf dog: Baybe, a Catahoula Leopard, was born 7/22/00. Her mom writes: "We adopted Baybe when she was 8 weeks old from a breeder. Being deaf, they couldn't sell her. This is our first experience with a deaf dog, and it has been a wonderful experience. Baybe passed her Canine Good Citizen test (CGC), and is learning agility. Our goal is to have her become a therapy dog. Although her brother and sister (hearing miniature pinschers) tolerate her at this point, we absolutely love her, and would not hesitate to own another deafie in the future." See Babye on her own website. Other pets: Bonnie, a hearing stag red miniature pinscher and Max, a hearing black and tan miniature pinscher. Deaf dog: Helga, an 11 week old Boxer. 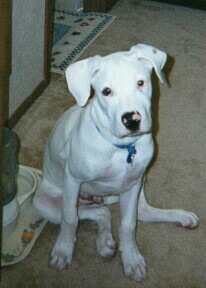 "Helga is a sweet little all white boxer pup we got from the breeder who we were buying our other pup, Katrina, from. The breeder told us that she would have to put Helga to sleep if she could not find a suitable home for her. 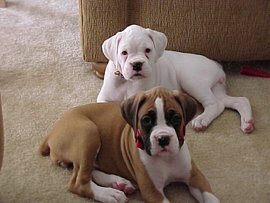 I could not allow that to happen, we went home with Katrina, our fawn colored female boxer pup and her white sister, Helga. At the present time they are 11 weeks old and more than a handful. Helga is very smart and we are slowly teaching her as well as her sister simple signings. We figured it would be best to train them both the same so the other will not feel left out." Other pets: Katrina, Helga's sister. Deaf dog: Annie is a 5 year old congenitally deaf Yorkie. "My little orphan Annie was acquired from a woman who brought her to the animal shelter where I volunteer to put her down due to her deafness. She is a great, happy, loving dog, and it is only now that she has come to live with me that I realize what a huge mistake her previous owner made! " Other pets: Lady, a blind Tea Cup Maltese. 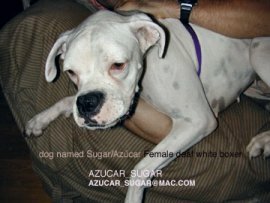 Deaf dog: Sugar/Azucar is a 2-1/2 year old white Boxer. "I fostered her and now adopted her from Florida Boxer Rescue. Sugar was abandoned but is progressing daily and becoming aware of basic life surroundings and surprises me with great exhuberance. She is awesome and a real sweetie! She is without hearing but makes it up with her personality and her other senses are just so acute." 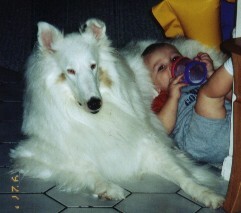 Deaf dog: Jake was a three day old puppy when he came into our life. At 5 weeks old we began to notice he was deaf and had it confirmed by testing at 7 weeks. Jake's deafness has done nothing to stop him. He is an amazing, loving dog despite his older sisters efforts. His face screams "I didn't do it!" and of course "Look I'm really cute, c'mere and pet me." In addition to his good looks and his treat getting skills he stuns us everyday with his friendliness and outgoing doginality. In the future we hope to train Jake to be a therapy dog. In the meantime he's an awesome addition to the family. Other pets: Daphney is every bit of a 4 year old Jack Russel Terrier. She is the true queen of the house and a big dog trapped in a little dogs body. Deaf dog: We adopted this dog from a breeder after reading about him on the DeafDogs website. 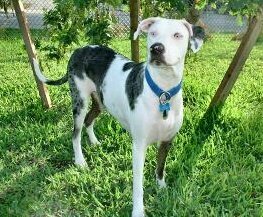 We have another Catahoula and thought we would like to work with a deaf dog. My partner already knows sign language and we are working on modified sign language hand signals. We just adopted him last week so we're in the beginning stages. Deaf dog: "Frosty is both deaf and blind in one eye - not that you can tell when you meet him. Frosty came to us from our vet. Even though he was a "temporary" foster, I fell in love with him the minute I saw him and knew he belonged with our family. Frostys best friend is my son Dylan. The two of them have a very special bond. They love to roll around on the floor and play together. I wouldn't trade my special boy for the world!! " Deaf dog: Pepper as you see loves the water. She will swim to fetch what you throw into the water. She is so full of energy. Pepper is so protected of me, and stays by my side most of the time. I have taught her to sit with a hand signal, and hope to teach her more in time. Had Pepper a few weeks before discovering she was deaf, I knew then this dog need special attention and I do try in everyway to give her the attention she needs. Human companions: Linda, Tony, Carla, and Chris. Deaf dog: Amanda's human pal writes: "We recently adopted Amanda from a rescue league. We had been looking for a Sheltie and finally found our Amanda. At the time, we had no idea she was deaf and neither did the shelter. It was 2-3 days before we realized that she could not hear a thing. This was a bit scary for us, as we had no info or experience with deaf dogs. I did some research on the internet to see what we had gotten ourselves into and found a ton of info. We are so glad that she has come into our lives. She is the most loving, gentle, smart dog. My kids can do anything to her and she is just happy to be with our family. She is truly meant to be with us. We have had NO issues or problems with her...totally housetrained, learning had signals, etc. She is awesome!" Deaf dog: Spanky is my second Jack Russell. My first one, Peanut, is 3 years old and was born unable to make any noise. Spanky I got a few weeks ago and quickly found out he's unable to hear. They're both such great dogs, I wouldn't change them for anything.